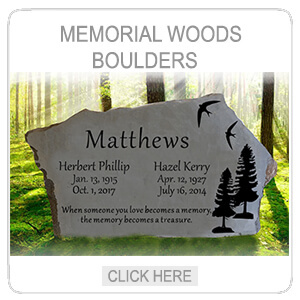 Express your memories through Meadowlark’s granite grave markers. Expressing your loved one’s story can take many different forms. 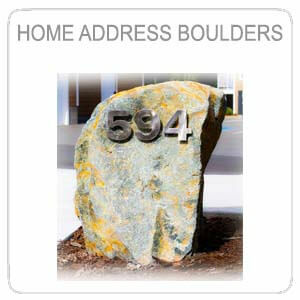 You can express it through Granite color, memorial size, shape, finish, lettering or designs. 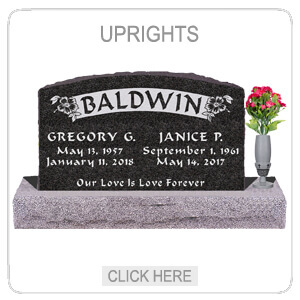 Meadowlark Memorials supplies a variety of colors and sizes of upright, pillow and flat marker memorial products. Serving all of Vancouver Island and the lower mainland of British Columbia. 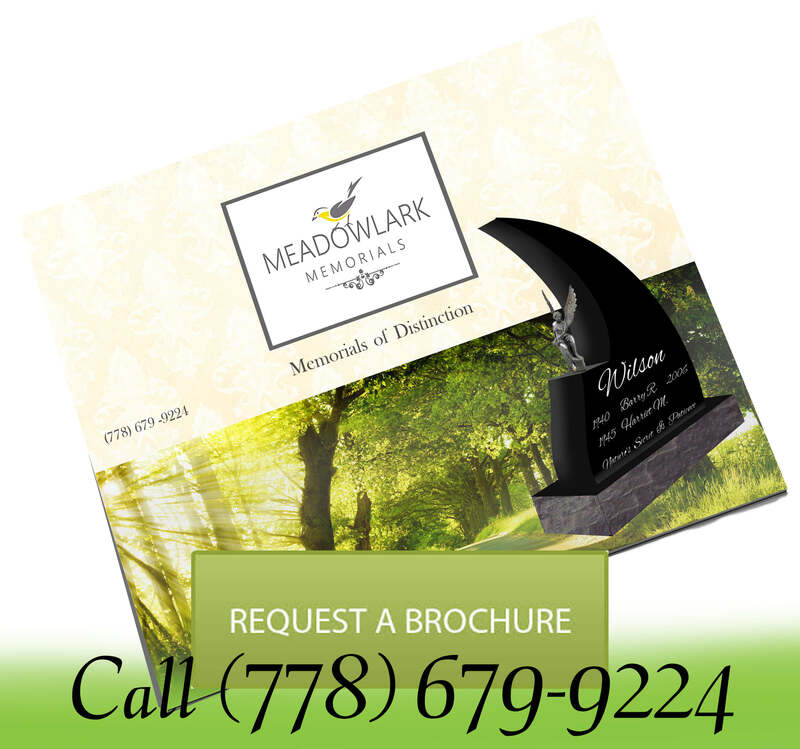 For further assistance regarding our granite grave markers and memorial products, please call Meadowlark Memorials at (778) 679-9224 and our memorial designers will be happy to assist you, or contact us. As you can see from the chart above, Galaxy black, Gem Mist, Mid Night Blue and Pacific Red can all have standard shallow cut letters. Galaxy black granite offers the best contrast for inscriptions. Portraits, scenes and other designs can be hand etched on black granite only. Other granite colours are unsuitable. To guarantee legibility of lettering and designs on monuments, Mahogany, Meadow Rose and Stan-stead Grey granite all must go through a sandblast process known as double outline flashed. Double outline flashed process simple means deep sinking the lettering and designs and removing the polish that surrounds them. Other granite colours are available, please contact us for availability. For Additional information regarding granite grave markers, please contact us. If you are looking for engraving services to add secondary names and dates to an existing memorial, please visit our On-site engraving page or contact us. Alternatively, if you are looking to restore an old memorial, please visit our restoration page. We have been very happy with the work that Carl Hughes of Meadowlark Memorials has done for us in St. Luke’s Church Cemetery. His onsite restoration of monuments in the cemetery has been excellent. Carl has been easy to work with and we highly recommend his work. It is just perfect! Thank you for making my home complete! The stone is absolutely beautiful and I can see it from my living room and my deck area. Blessings to you and thank you again! Please feel free to use this photo or me as a reference as well. You do beautiful work and you ease a person’s heart too. Excellent company to deal with. Meadowlark Memorials offers a wide range of services. The mobile added-inscription unit allows the monument to remain in the cemetery when the future date will be added. 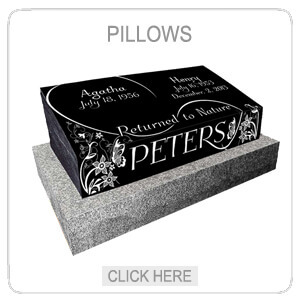 Contact Meadowlark Memorials to start designing Granite Grave Markers today. Band – A continuous band or section on a memorial which can be raised, flat, recessed or carved. A band is quite often used as a nameplate. Base – The lower part of a multi-sectioned Memorial. There might be a first, second and sometimes a third base. Bed – The flat, top part of any memorial base which is made to fit the bottom of the tablet or main part of the headstone. Slings -Straps used for lifting monuments. Bevel marker – Rectangular, angled or sloped-top marker. Bruise – The result of two stones hitting together; also called a stun. Buffing – The finishing touches to a stone’s polished surface. Cap – The top part of a monument set on top of a tablet. There can be more than one piece to a cap. Capital – The top part of any pillar or column. Carving -The process of shaping rock to the desired finish; includes sandblasting, sculptural, shape, line and hand carving. Chipped –Usually caused by accidental damage, small chips off the edge of a stone. Columbarium – A vault with a compartment known as a niche for urns containing cremated remains of the deceased. Coping – A stone preparation outlining the border of a burial lot; also Known as curbing. Cremation or cinerary urn – A urn used to hold the remains of a body. Cubical content – Total measurement of cubic feet and inches of a piece of stone, raw or finished. Curbing – The setting of a stone curb or low enclosure around a cemetery burial plot. Design – A drawing, or photo of a monumental artist’s perception of a custom designed monument. Die – The main body portion of any memorial whether big or small. Dowel – A pin made to bond two joints of stone. They are usually made of noncorrosive metals, such as stainless steel or aluminum. 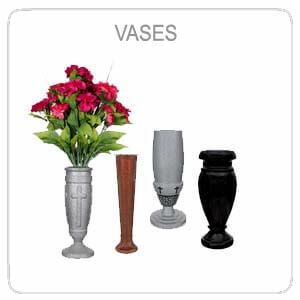 Drainage holes – Small holes drilled or cored in a section of a memorial or cemetery vase where it is necessary to carry off the water. Epitaph – Any inscription or writings on a monument in memory of the person. From the Latin meaning “funeral oration,” an epitaph usually states something about the deceased. Epoxy – A thermosetting resin used as a strong glue to permanently attach two objects together. 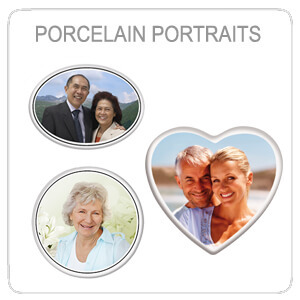 Etching -The term is usually used when drawing a person’s portraits or scenes on granite. Also known as hand etching, laser etching, and diamond etching. Face – The front of any monument or the forward portion of a slant-face marker. Gold leaf – A thin layer of gold that is set into engraved carvings, usually to enhance the carving. Grass marker – A rectangular, flat stone or bronze level with the ground. Also called a lawn-level marker – Flat Marker- an outdated term is a flush marker. Grout – The excess materials made while quarrying stone. Joint – Any area where one piece of stone has been prepared to fit another. Usually used to designate the bottom of the main part of the tablet. Ledger – A memorial stone laid prone. Usually, covers all the graves. Lift – To understand this term, you must also understand “rift” and “head grain.” The lift is the grain in stone that runs at right angles to the rift, which is the direction in which the stone splits easiest. Lithichrome – A liquid substance that can be applied to carvings or into letters to enhance or alter the natural color of the stone. Many varieties of colors are available. Margin – The outer portion of any stone memorial, which is given a special finish for effect. Can be sawn, steeled, hammered or polished or any combination of all 4. 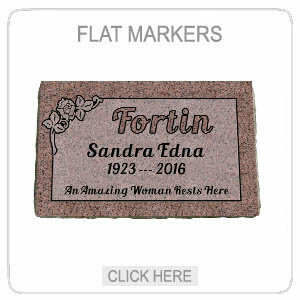 Marker – A headstone, usually small rectangular used to memorialize one or many individuals. Mausoleum – An above ground memorial used for burials. Memorial – A structure that reminds us of a specific person or even. Obelisk – A pointed pillar. Ornament – The various design, statue, carving, (floral and otherwise) used to convey messages or to improve a design. Granite Grave Markers made on Vancouver Island.